Sometimes it’s easy to feel like a part of history, a witness of the past, the sense of time lost. All it takes is a walk along the lively streets of London to be catapulted inside a faded postcard: This is the enchantment of ghost signs. Ghost signs are incredible examples of advertisements, very much used before newspapers and magazines took to advertising companies. The astonishing thing is that ghost signs were painted by hand on the facades of buildings, theatrically immortalising products and items of that period. Later, with the increasing use of new advertising outputs, ghost signs knew their declining years, replaced by other advertising methods such as handbills or specialised journals. Many of these ghost signs are still visible today and they are still maintained and conserved on the bricks of these edifices, not only in the United Kingdom but also in other places, such as America, France and Australia. These hundreds of years old advertisements sometimes require some restoration works, considering that factors such as ravages of time and weather conditions affect their existence. 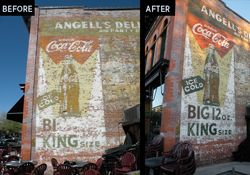 A good example of the conservation of ghost signs is a Coca-Cola sign in Colorado. The advertisement was created in 1958 by a native painter of Fort Collins for Angell’s Delicatessen, a food store and also a tenant of the building. In 2011 an important work to keep the ghostsign from deteriorating was carried out by experts, restoring the sign to its former glory and maintaining it as part of the local history. Back in England, the ghost sign collection of the the Advertising Trust counts about 800 ghost signs – a real treasure. Walking down Gray’s Inn Road in London, near Theobald’s Road, can be really amazing. Direct your gaze to the uncountable bricks of the edifices, and a ghost sign will be there, ready to make you daydream about the story it is telling. This ghost sign is one of many examples of Gillette’s advertisements. At the top of the ghost sign we discover the inscription “Boro Stratford had over 10,000 sites like this”. Boro Stratford was a kind of outdoor advertising company during the time, and this suggests that there were another 10,000 ghost signs like this one. 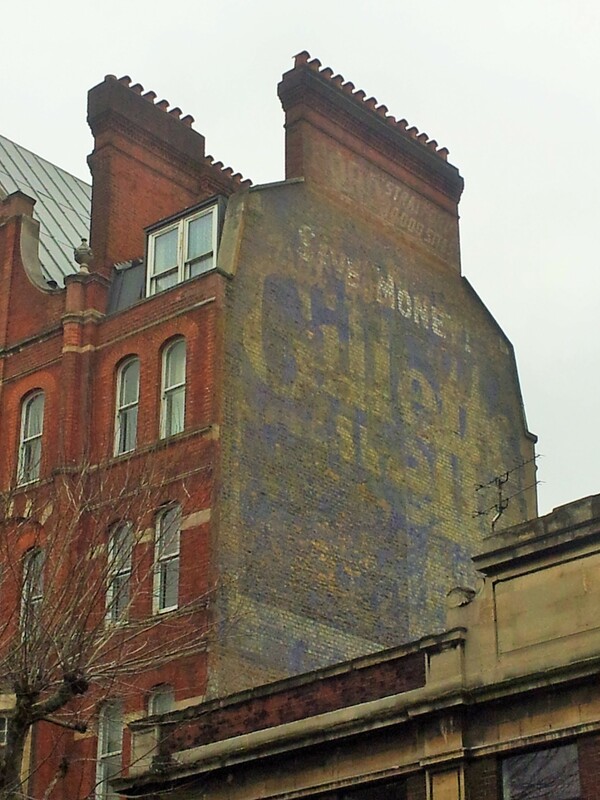 Ghost sign expert Sam Roberts, connected to Advertising Trust, explained that the sign refers to a large campaign carried out by the Gillette Company, with common elements such as the blue background and the font style. This large ghost sign probably dates back to 1930-1940, a real dive into the past. Ghost signs have also been discovered in recent years, thanks to ghost sign lovers wishing to preserve this special inheritance, like faded postcards of faraway days.